So it turns out the world isn't flat. Huh. Who knew? OK, turns out not quite everyone, but for most people we only ever care about the world being round when we're flying. Or alternatively, running software that helps anyone, anywhere in the world turn up to their game on time. In that case, time + timezone becomes really important ; because 9am your time might be super different to 9am my time. So here's what we do at Teamstuff land. 1. We store every time you give us in Coordinated World Time, alternatively known as UTC. 3. Which means we need to work out how to translate world time to local time - and that's the timezone. Where do you set the timezone? 2. We ask you for a physical location - and we assume that the time you've entered is local for the place you're playing or training. That seems pretty logical right? 3. 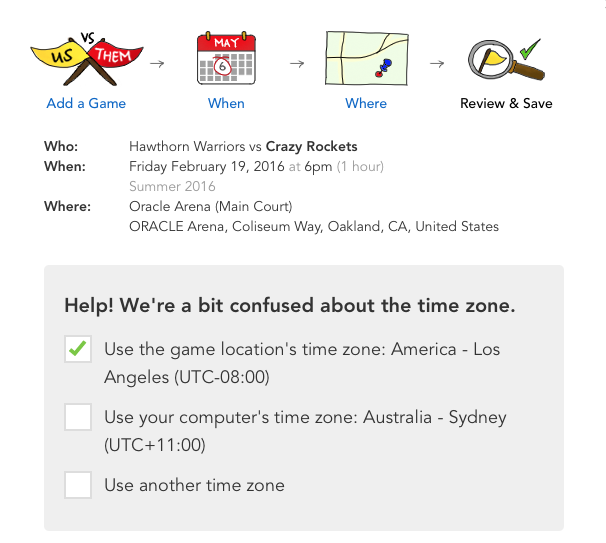 Then - just to be really sure - and because some teamstuff users are indeed airline pilots - we double check your current timezone ( one one off your phone or computer ) vs the game or training timezone. The vast majority of the time these are the same, since most us play locally of course. If they're the same, we're pretty sure we know what your timezone is. And so now we have a local time, a local time zone and we translate these accurately to the UTC time. 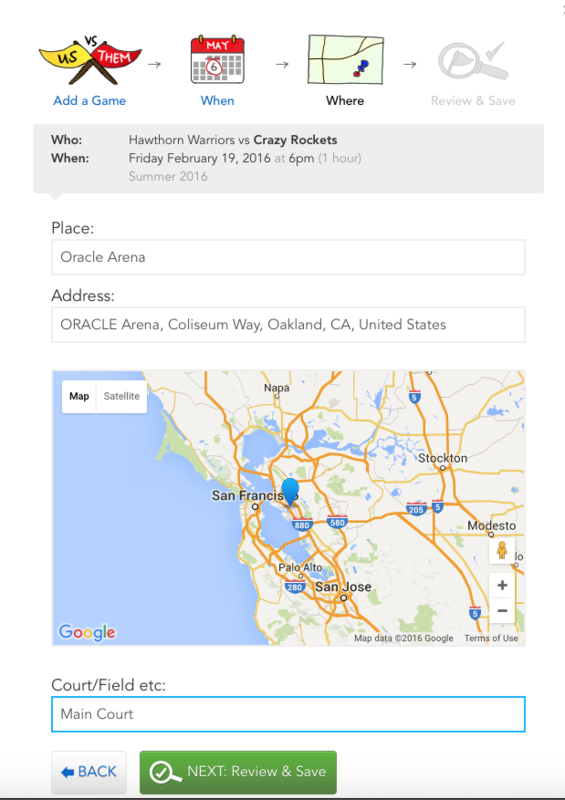 But what if I'm in Melbourne, and my team is playing in San Francisco? Take a look at the screen below. I'm setting up a game to be played in California at 6pm - but I'm doing that from my office in Melbourne. If you get this - please pay special attention to it. We tend to think people add games at the time for the place. So we default to the local game timezone - as you see above. But once you've set the time - we then translate into that UTC time - and that makes sure all the reminders, all the emails - and most importantly - all the team will be delivered on time. What do we display in teamstuff? Note that whilst we store everything in computer friendly UTC - we display start times to you in local human time. We called it 'whistle time' - the time that is on the ref's watch as she blows her whistle to start the game. Why don't we support IE 8? What browsers does teamstuff support? When is the Windows Phone app coming out? I'm not receiving emails from teamstuff.